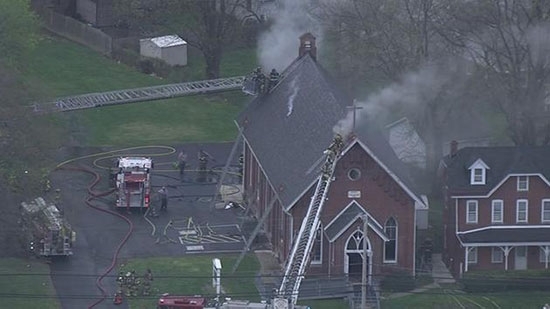 A historic church in Delaware County was badly damaged by fire on Monday morning. It broke out around 8:30 a.m. at the Memorial Presbyterian Church on the 3200 block of Chichester Ave. in Boothwyn. Heavy flames could be seen pouring from the entrance. The blaze rose to two-alarms with about 100 firefighters on scene according to Ogden Fire Chief Craig Small. The fire broke out in the back of the church, but officials still have to determine the cause. There is heavy damage to the inside but the building is still structurally sound. The church dates back to 1885. No one was inside today, but it was full yesterday for Easter services. Reverend Robert Kaufman said a firefighter pulled out a processional cross that is used every Sunday. "A firefighter brought that cross out to me all blackened from the smoke but it's in perfect condition. It’s a word from the Lord: We will rise again," Kaufman said. See video of the fire below. The burned body of man was discovered Monday afternoon in Northeast Philadelphia. The remains were found in a vacant sushi restaurant on the 400 block of Franklin Mills Circle around 2:30 p.m. Construction workers saw the body and called 911. The owner of the building say he had not been there since January. The property was boarded up. Police are determining the age of the victim and how long they have been deceased. Easter weekend was particularly violent on the streets of Philadelphia. 4 people were killed and 16 others injured in shootings across the city. Gunfire rang out in all sections of the city starting Saturday and continuing into early Monday morning. Victims ranged in ages from late teens to mid 30's. Police are continuing to search for all gunmen involved and hope the violence doesn't keep rising as the warm weather returns.